It’s an agreeable morning in Laos. The last few days have been quite hot and humid, but there’s a gentle rain falling and a cool breeze is blowing through the open windows and front door. 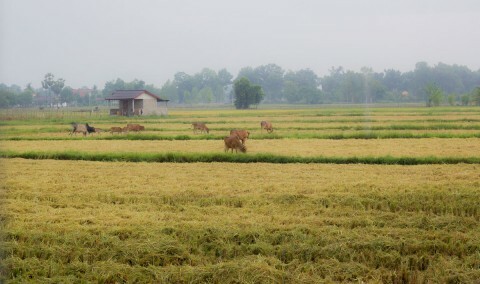 In the kitchen of my new house that I’m renting (more on that in a later post), I can look out at a small herd of cows grazing on chaff from the newly-harvested rice field that stretches into the distance. Very relaxing. Quite agreeable. 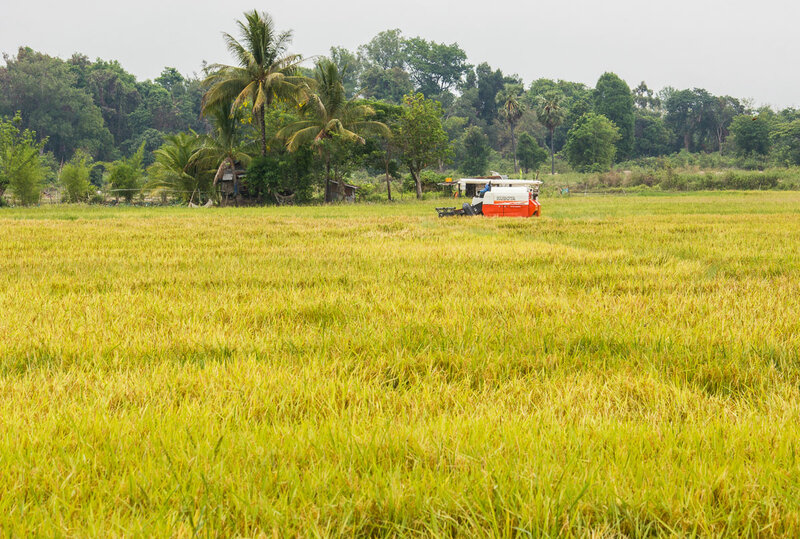 A modern harvester works on a field of stick rice (glutinous rice). Many farms in Laos still use the old method of harvesting by hand with machetes or scythes. After the harvest, the chaff is left for a few cows to enjoy. You never know what you’ll run into while you’re traveling or after you’ve settled in somewhere. Vientiane can be hectic sometimes, but not far from the city you can find some bucolic scenes like these. It’s a bit like Frodo talking about his Uncle Bilbo in The Fellowship of the Ring. So, traveling can lead to some interesting, exotic, adventurous locales. Traveling’s good for you. There are a lot of advantages to be had in traveling. What are they? Head over to Positive Health Wellness to read “8 Reasons Why Traveling is Good For Your Health.” It’s an interesting and informative article, and maybe it’ll set off your wanderlust. Do some traveling and exploring, if you can. Steer a canoe down a scenic river, enjoy the grandeur of majestic mountains, or just watch the cows. The benefits are many.